The World of Madelon Vriesendorp at the Swiss Architecture Museum is an exhibition that for the first time ever brings together Madelon Vriesendorp’s wildly diverse practices from the past forty years. Madelon Vriesendorp is one of the founding members of the OMA Office for Metropolitan Architecture in 1975 (together with Rem Koolhaas and Elia and Zoe Zenghelis). 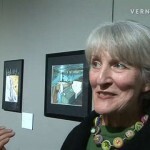 The World of Madelon Vriesendorp – Paintings, Postcards, Objects, Games, 1967 – today includes 50 paintings and drawings, among them her painting Flagrant Délit (in which the Chrysler and Empire State buildings are caught in post-coital embrace by the Rockefeller Center); two collections of Americana postcards collected by Madelon Vriesendorp and Rem Koolhaas in New York during the 1970s, that form an accidental archaeology of the USA; a long-lost 1980 animation, co-authored with Teri Wehn-Damisch; and Madelon Vriesendorp’s Archive of miniature objects, models and figurines that includes an Indian Minnie Mouse in regional dress fraternizing with a winged Father Christmas. Finally, there’s also a special, interactive installation: a live-size incarnation of the self-penned psychological diagnosis kit, The Mind Game. The exhibition has been curated by Shumon Basar (Cultural Projects director, Architectural Association) and Stephan Trüby (Stuttgart based architect/theorist). 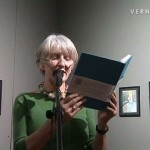 According to Hans Ulrich Obrist, Madelon Vriesendorp is an Ê»almost unknown artist geniusÊ¼. This exhibition, which originated at the Architectural Association in London, aims to redress this discrepancy and situate Vriesendorp in her rightful place within late 20th century culture. The World of Madelon Vriesendorp runs until the 22nd March, 2009. Impressions of the opening reception and the Basel Museum Night at the Swiss Architecture Museum on the 15th and 16th January 2009. In addition to this No-Comment video of the opening reception, we will publish two more videos: A conversation between Madelon Vriesendorp and curator Shumon Basar; and the Talk that was held on the evening of the Basel Museum Night.